The research finds that the total costs of federal regulations have further increased from the level established in the 2005 study, as have the costs per employee. More specifically, the total cost of federal regulations has increased to $1.75 trillion, while the updated cost per employee for firms with fewer than 20 employees is now $10,585 (a 36 percent difference between the costs incurred by small firms when compared with their larger counterparts). To be sure, some forms of regulation, such as environmental protection, generate benefits. There generally are not good estimates needed to produce cost-benefit analyses, but it is quite likely that the costs are much higher than necessary – particularly for economic regulation, the burden of which is more than three times larger than the costs of environmental regulation. Not surprisingly, Mr. Podesta is totally wrong. It’s actually not that challenging to balance the budget. And it doesn’t even require any spending cuts, though it would be a very good idea to dramatically downsize the federal government. Here’s a chart showing this year’s spending and revenue totals. It then shows the Congressional Budget Office’s estimate of how much revenues will grow, assuming all the 2001 and 2003 tax cuts are made permanent and assuming that the alternative minimum tax is adjusted for inflation. 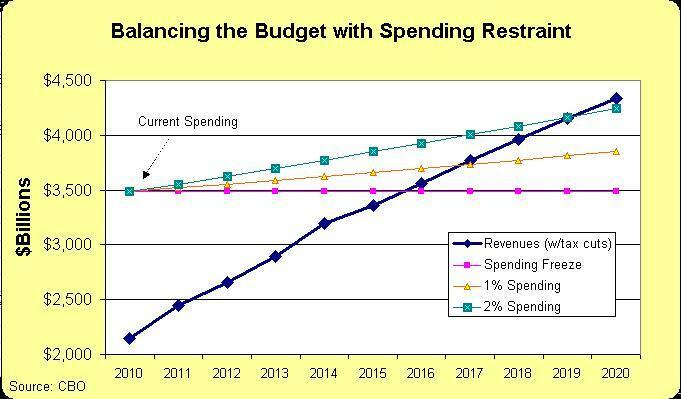 As you can see, balancing the budget is a simple matter of limiting the annual growth of federal spending. So how is it that Mr. Podesta can spout sky-is-falling rhetoric about “draconian” cuts when all that’s needed is fiscal restraint? The answer is that politicians in Washington have concocted a self-serving budget process that automatically assumes that all previously-planned spending increases should occur. So if the politicians put us on a path to make government 8 percent bigger next year and there is a proposal to instead limit spending growth to 3 percent, that 3 percent increase gets portrayed as a 5 percent cut. This is a great scam, at least for the political class. They get to buy more votes by boosting the burden of government spending, but they get to tell voters that they’re being fiscally responsible. And they get to claim that they have no choice but to raise taxes because there’s no other way to balance the budget. In the real world, though, this translates into bigger government and puts us on a path to a Greek-style fiscal nightmare. The goal of fiscal policy should be smaller government, not fiscal balance. Deficits are just a symptom of a government that is too large, as I have explained elsewhere. But the good news is that spending discipline is the right answer, regardless of the objective. I explained this in more detail for a piece in today’s Philadelphia Inquirer. Here’s an excerpt.